After I was surprised with a new family addition into my life as a mid-40 year old veterinarian, I found that my world was rocked. Life altered. No more work-life balance. Here, I went from being an ultra-efficient-on-the-run veterinary specialist to a I-cant-get-anything-done-with-mom-brain. So, in today’s VETgirl online veterinary continuing education blog, I wanted to suggest the top 10 things that can help you achieve your work life balance, whether or not you have a kid or not! This is so important, as our veterinary profession needs better self-care. 1. Learn to be more efficient. 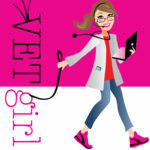 In a previous VETgirl online veterinary continuing education blog, I’ve written about how to be a more efficient veterinarian. Things like doing doctor things, focusing on finishing your medical records (versus just chatting with people), being an efficient typer (or splurging on Dragon® veterinary dictation to dictate your medical records), taking short cuts (like using more AAHA abbreviations in your medical records), triaging your patients more efficiently, and being more efficient with your time (e.g., don't stand around!). Live by this. 2. Delegate. When it comes to being more efficient in the veterinary clinic, empower your veterinary technicians and team to help you more. Take the time to explain things better and teach your technicians so they understand what you are doing, why you are doing certain procedures, and once they understand, they can help you be a stronger, more efficient doctor. For example, if you explain why you're choosing a certain sedative versus why you're using an olive tip versus a Tomcat, your staff can help you set up efficiently. Delegate appropriately! (That's one of the reasons why Garret and I started the VETgirl TEAM membership... so you can train all your staff to increase the quality of care at your clinic!). 3. Outsource. My general philosophy is to look at your hourly rate. If it’s less than your hourly rate, triage or outsource it. You don’t have time to vacuum and have a Pottery Barn perfect house. Instead, consider hiring a housecleaning to help you every 2 weeks. In between, splurge on a Roomba® Pet Vacuum . (I’m a firm believe that every pet-owning veterinary professional should have one, as it’s a life saver and makes cleaning oh-so-much easier!). Utilize the app Next Door, and higher the neighborhood kid to mow your lawn. Or poop scoop. Or be a mother’s helper for $10/hour. It’s worth it. Likewise: taxes. Is it really worth the stress of you doing your own taxes, knowing it’s going to stress you out for weeks? Instead, it’s always worth the money to pay a professional. 4. Use Google calendar more. Hey Hotmail and Yahoo peeps. It’s time to get off that antiquated email server. Instead, sign up for a free Gmail account and utilize all the free, cool tools that Google has to offer. The one that saved my relationship with my husband? Google calendar. Granted I have a crazy traveling schedule compared to most veterinarians out there, but this is an easy way for my husband to see what my upcoming travel is, when my kid’s swim classes are, and when we have scheduled date nights. I also utilize the repeat ability to schedule things so I don’t have to fill my brain with useless things. For example, when to mail my quarterly taxes. And what day recycling is. And when to weigh my skinny chronic renal failure cat or bring him in for blood work. I schedule this on my calendar as an easy reminder, set it to repeat as needed (e.g., every quarter or every 6 months, etc. ), and voila, it’s off my to-remember list. I also use this to remember which patients to check on, so I can get rid of the annoying Post-It notes that clutter my clinic desk. I’ll simply type “Check UCS on Fluffy McDonald” on Google calendar, and voila, off my mental checklist until that day. 6. Have a monthly date night. It sounds boring to schedule a weekly or monthly date night with your partner or spouse, but it’s worth it. My colleague used to complain how expensive date night was. After all, between the costs of the baby sitter, the dinner, the movie tickets, etc., you’re down $100. And you know what? Your relationship is worth it. Because your partner helps provide the support, mental health and day-to-day survival in your house, and building that relationship and stepping out of the normal day-to-day is lifesaving. 7. Wake up 30 minutes earlier. I never would have called myself a morning person. However, what I found is that I’m most productive from 7-9:30AM. By waking up 30 minutes earlier (if you have kids, wake up 30 minutes before them! ), you have some quiet time to get things done while calmly drinking your coffee. This is the most peaceful time of the day and I really cherish it. Which means you need to go to bed 30 minutes earlier. Utilize the bedtime function on your iPhone to remind you to get to bed earlier. You’ll soon cherish that time. 8. Automate your life. Make things easier for yourself. If you’re still writing checks to pay bills, this is a must-do for you. Set all your bills on automatic payment, so you don’t have to deal with them. Take the time to open the statement and make sure there aren’t errors, but in general, automate as much as you can so it saves you 20 minutes of bill-paying time. Because it’s mundane and boring and you don’t need to do it. Another way of making things easier for you? 9. Declutter. If you’re like me, you get over 50-100 emails a day. Don’t want to stress over all those emails? Unsubscribe to ones you don’t want to see (except for VETgirl emails, of course). Once you declutter both your Internet space and home space, you’ll mentally feel clearer too. 10. Learn to say no. This is the biggest one. Learning to say no is hard for veterinary professionals, right? After all, we're so caring and compassionate we want to say yes so we don't disappoint anyone. However, it's so important that you learn to say no to preserve important boundaries for yourself at home and at work. For example? If you get invited to a backyard BBQ and feel too exhausted, it's ok to say no. If you get asked to write yet-another-toxicology-book-chapter, it's ok to say no (Me. Must listen to advice). If you get asked to pick up another overnight shift when you're burnt out, just say no. 1) Does it spark joy? If it doesn't, don't say yes. 2) Will this directly benefit me? It sounds greedy, but to maintain work-life balance, you have to be greedy about your quality of life. I’m also a huge fan of the book The Life-Changing Magic of Tidying Up . This book written by Marie Kondo, is a fast read, and literally will take you less than an hour to breeze through it. While I didn’t believe in every aspect of the book, I do believe a minimalist approach to life is freeing. Purge, clear, and feel mentally clear in the process. I’m still in vet school, but I think employing all of this advice now will make it that much easier for me to achieve balance once I start working. Thanks! Thanks for the article- have always wondered what your secrets were to balancing it all! One more option for your readers to consider: My husband and I add tasks for each other and note grocery items as we run out using the shared app Todoist. You can easily cross off tasks assigned as they are completed! We use it in addition to the Google calendar which you mentioned. It helps us keep track of everything in the household! Great suggestions – thank you! Never heard of it and will check it out! This is great! As a mom of three and a vet, I employ lots of these tricks. I also recommend Instacart or some sort of quick fresh, grocery type delivery service. The app is key bc can add food or goods immediately and get within two hours. Not going to the grocery store anymore has sparked “joy” for me! Love this! These are some great tips, now if only we could manage to also slow time down so we can enjoy the little time we get with our families! I need to print this out as a reminder at work, I’m a terrible delegator! Thank you!